Sporting an updated look for 2017, White Lightning is using simple intended conditions terminology to ease confusion with its line of lubes. White Lightning director of marketing Derek Goltz shows us the lubrication champion’s new look for 2017. White Lightning has undergone a facelift for 2017, with a clean new look and simpler labeling on its line of award-winning lubricants. Forget the confusing lubricant terminology, and instead choose your lube based on three straight forward intended conditions options. To celebrate this change, White Lightning teamed up with Louis Garneau to create a custom women’s road bike sweepstakes. Enter on their website between now and the end of the Sea Otter Classic in April for your chance to win this sweet bike, along with a Thule Travel-Pro bike case, a one year supply of White Lightning product, and more. Enter here. 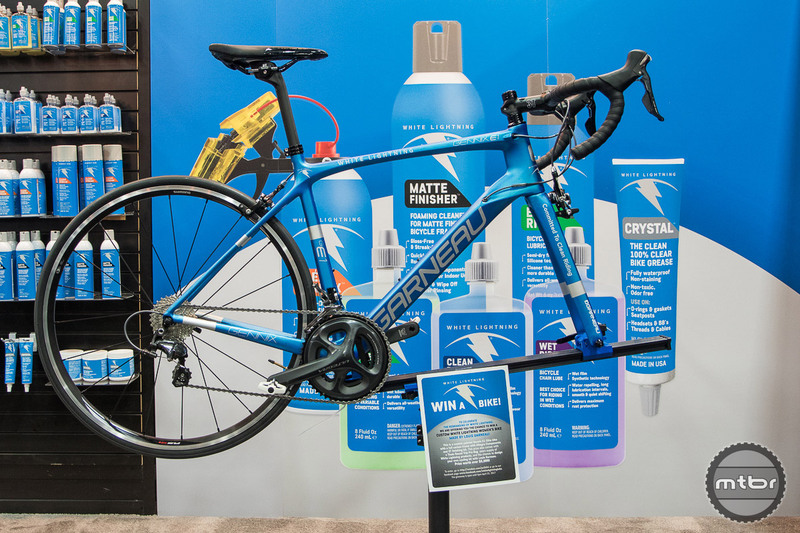 At Interbike 2016, White Lightning had an intriguing demo that compared pre-treated bike chains to illustrate in real-time the difference a good lube can make. 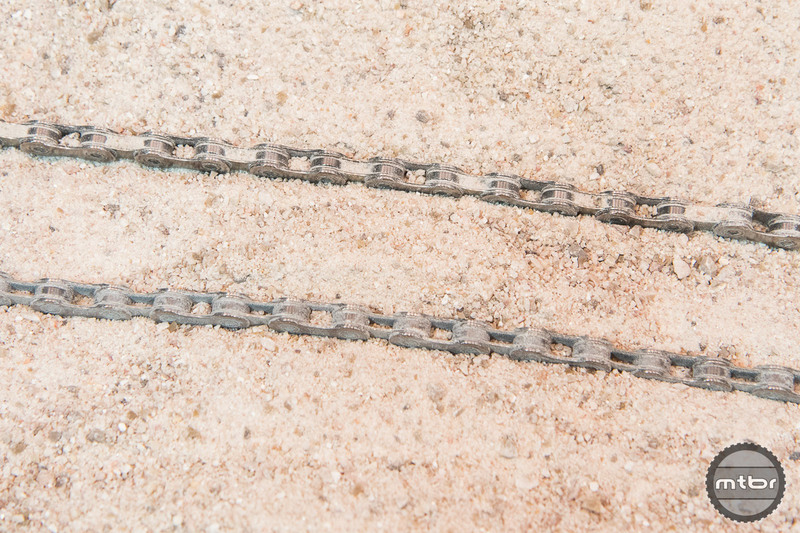 After submersion in the sand, the White Lightning treated chain shows only a little bit of build up, while a competitor’s product leaves the other chain filled with sand. It’s just further proof of how you can save money and increase the life of components by keeping your chain lubricated with a quality product. 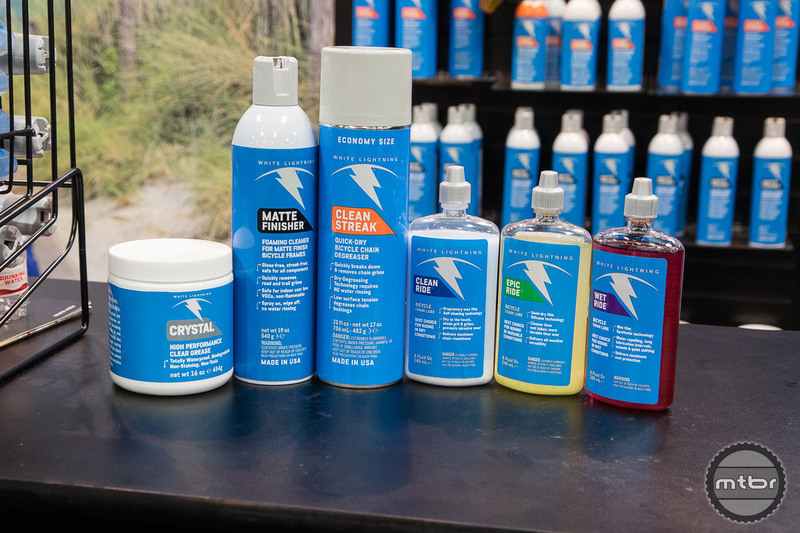 White Lightning is one of the oldest names in the cycling maintenance and they have freshened up their products with new packaging and a new logo. Matte Finisher is formulated specifically to remove road and trail grime, fingerprints, nutrition residue, oil splatters, and rim glaze. Matte Finisher maintains deep matte colors and offers a streak-free finish that is safe for all surfaces. 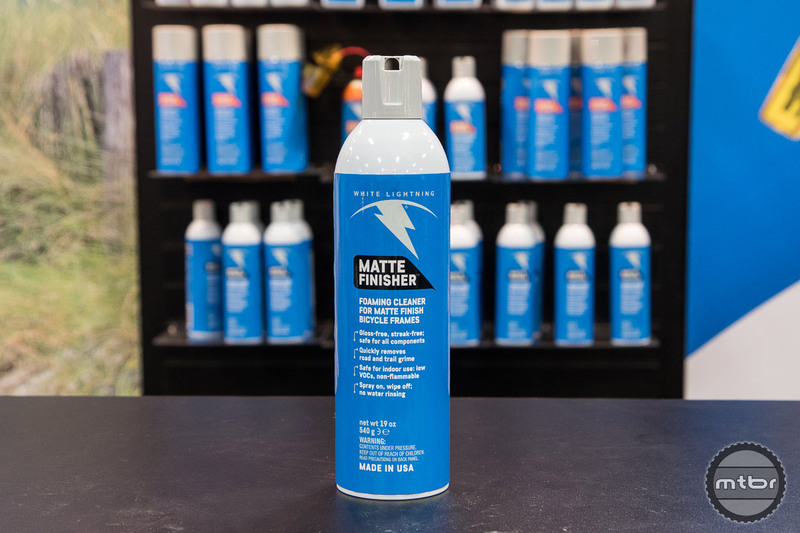 Thanks to clinging foam technology, Matte Finisher makes it easy to spot clean with precision and confidence, delivering a streak-free, gloss-free finish, which helps matte finish bikes look "showroom" new. And it's also safe for use on clear-coated bicycles. To celebrate the rebranding of White Lightning, they are offering a chance to win a custom White Lightning women’s road bike made by Louis Garneau. It is a custom painted Gennis E1 Elite with a full carbon frame, Shimano Ultegra components, and a 3T finishing kit. The prize also comes with a Thule Round Trip Pro Bag, a one year supply of White Lightning products, and the chance to design your own cycling kit with Louis Garneau. Total prize package is worth over $5,000. 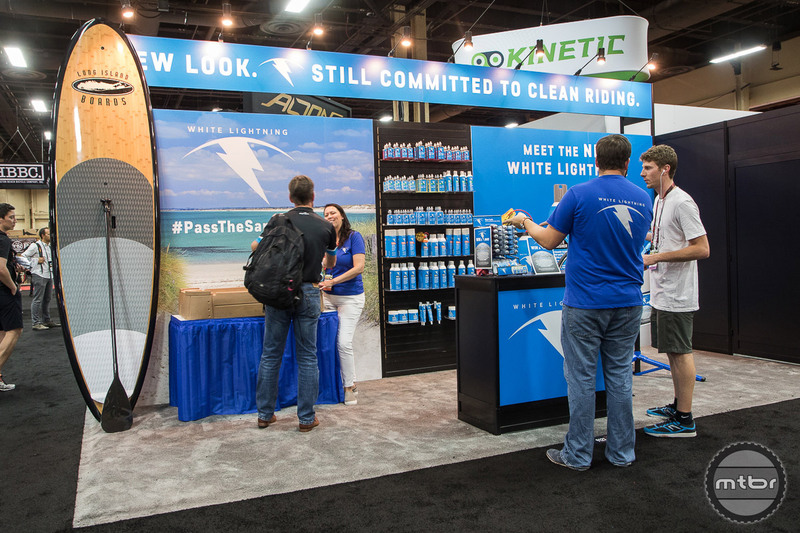 At Interbike 2016, White Lightning had an intriguing demo that compared pre-treated bike chains to illustrate in real-time the difference a good lube can make. 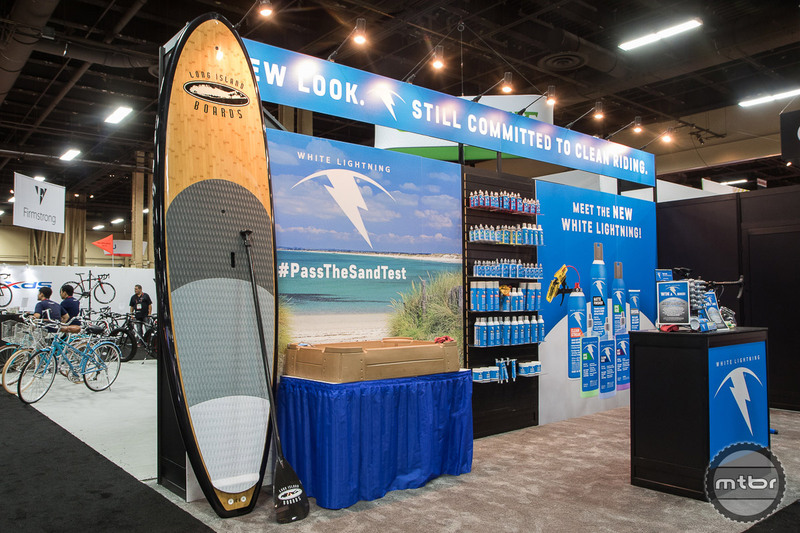 White Lightning products have grown to become recognized globally as the brand that means “Clean Riding." From Clean Ride to Epic Ride to Wet Ride – all White Lightning lubricants perform better and stay cleaner longer than those of the competition. When I spoke to the rep from white lighting during Sea Otter this year, he said that a better bottle tip is in development. I am frustrated that for anything other than their smallest bottle, the moment you tip the bottle over to pour on the chain, a large quantity of lube squirt out and go to waste. Has this problem been properly addressed?